Back in the mid 1940s, the only thing required to find fame in the movies was nothing more than some horribly disfiguring disease. 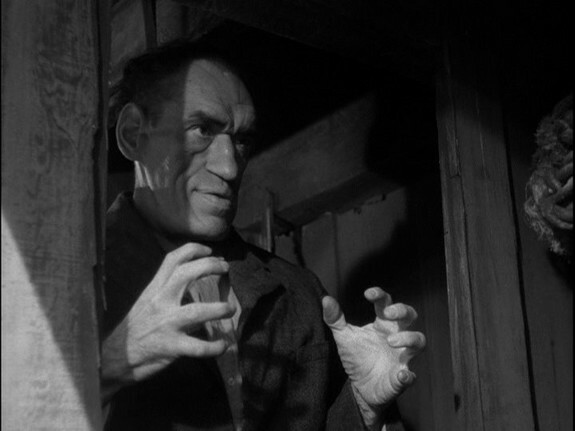 How else to explain Rondo Hatton’s brief and unremarkable run as a screen heavy in a couple of low budget horror flicks released during the period? Rondo was a normal guy who went and fought for his country in World War I. The bad guys dumped mustard gas on him and he got sick. After these events, sources differ as to what happened. Some swear that his condition (acromegaly) was caused by this exposure to the gas, but others are equally staunch in saying that one had nothing to do with the other. I don’t suppose it made much difference to Rondo. What this acromegaly caused is the production of growth hormone after a person is all grown up. Deformities result since the growth hormone is causing certain parts of Rondo to grow (soft tissue stuff on hands, feet and face) while the rest of Rondo doesn’t grow. The result is a Rondo that Universal felt obliged to exploit as a misshapen villain. 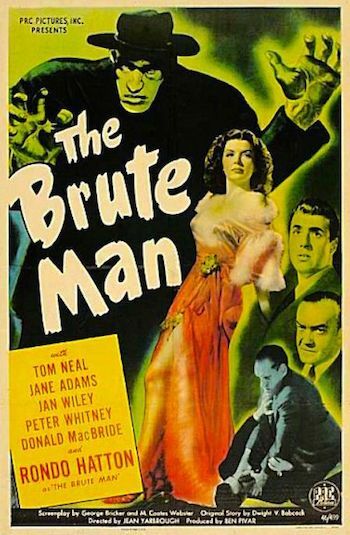 Rondo died in early 1946, before The Brute Man was ever released, and Universal promptly sold it to PRC washing their hands of the whole sordid affair. As for the film itself, the headlines are blaring that the Creeper is on the loose breaking people’s backs! As you may have already surmised, this is one of those movies where the plot is continuously recapped for no good reason by those spinning newspaper montages. Along with the newspapers whirling around like some type of informative Sit-N-Spin, we get the “only in the forties” montage of police cars careening through the city streets, squealing tires and responding to each emergency with “all available Model Ts.” This gives the movie that Keystone Kops aspect you’d probably were hoping for since the rest of the goings on are so awful. Don’t get me wrong – guys in funny hats with Snidely Whiplash mustaches are nowhere to be seen and these scenes are very brief, but so little of interest occurs, any action is welcome. Whenever a blind piano playing woman is giving lessons to a smart mouthed girl in a horror film, you realize that you’re going to have to take your entertainment where you can get it. 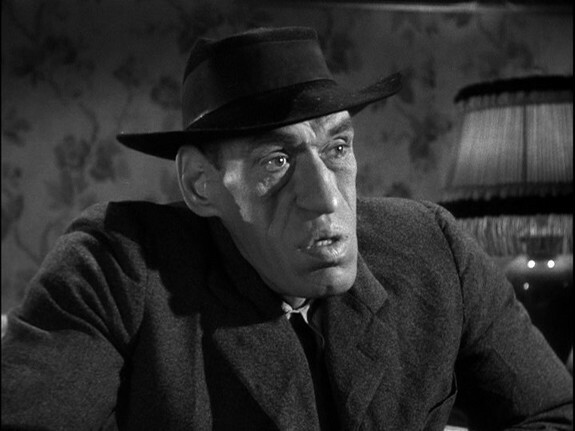 Rondo plays a guy named Hal Moffet, a hideously disfigured guy with a chip on his lumpy shoulder. His targets are some old college chums for the most part and anyone who looks at him wrong the rest of the time. 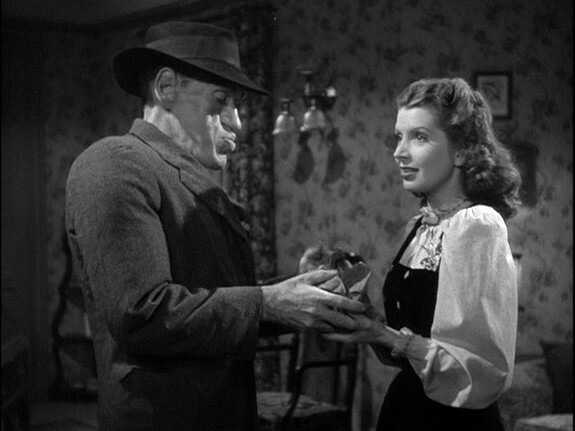 After killing an acquaintance, he escapes into the apartment of a blind woman, Helen. The cops come and look around, but don’t find him. After they leave (how come they didn’t notice she was blind? Or mention they were cops?) she and Hal talk a little bit and she treats him really nice and he’s kind of touched by that and this is one of the beauty and the beast gimmicks we’ve seen a thousand times before done a thousand times better. The cops eventually find out where the Creeper was hiding and also recover an old newspaper clipping that talks about Hal Moffet, his first victim (Joan), and two other people, Clifford Scott and Virginia Rogers. This is their big clue and they go talk to Cliff and Virginia who are now married. Cliff tells the cops all about Hal Moffet via a very long and silly flashback. They were all pals in college. Cliff and Hal both wanted Virginia. Joan was a girl that had the hots for Cliff, but she really didn’t seem to play much of a part in things. In fact, it makes little sense that Hal would want to kill her. At this point in time, Hal was a handsome, athletic guy with a temper. Cliff was smart and helped Hal with chemistry. However, Cliff wanted to take Virginia out so he intentionally screwed up Hal’s class work and so Hal had to stay after class in the lab, mixing dangerous chemicals together. This movie is so club-footed in its story telling that they then have Cliff and Virginia walk by the lab and make faces at Hal in the window, causing him to throw a beaker full of ugly onto the ground. It explodes and disfigures him. Cliff and Virginia can’t imagine why Hal is back after all these years to kill them. The Creeper periodically goes back to visit Helen’s. She’s got one of those old movie-type blindness – the kind that can be miraculously fixed if she gets an expensive operation. This leads the Creeper to try and kill two birds with one stone when he goes over to the Scotts’ house to kill them. He figures he can kill them plus steal some jewels that Helen will be able to pawn for the money for her operation. Hal shows what a dumb jock he was by thinking that the stolen jewels of two people that you just murdered will be no problem for a blind chick to pawn at the local pawn shop. Whatever money Universal got from selling it to PRC was way more than they deserved. While we applaud Universal’s obvious exploitation of the deformed Rondo and its efforts to feature this non-actor in several movies based solely on him being a real live circus freak, there can be no justification for putting him in such a dull and dull-witted movie. Rondo has zero charisma and when he’s not muttering his lines like they were being fed to him a word at a time, he’s looking like he has no clue where to stand or how to stand in any particular scene. The blind chick and the ugly guy angle was so predictable that you wonder if Universal had just given up on this Creeper gimmick altogether and was just dumping in all the ugly guy clichés they could manage into a single movie. He’s disparaged by women, feared by men, loved by dames who can’t see how ugly he is, and even has a heart of gold and tries to help out the blind girl! Rondo made some other movies including House of Horrors, so if you want to see his mustard gas puss in action you might try one of those, or you can just gaze at his picture in this review and figure that’s all you really need to know.